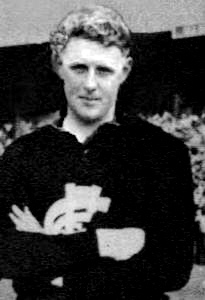 Calder played 22 games for Carlton commencing in Season 1950. He kicked a single goal for the Blues. Calder won the 'Val Murie Trophy' for finishing second in the best and fairest players for the VFL second eighteens in 1951. He was also vice captain in the 1951 reserves premiership team. Calder was recruited from Frankston in the Mornington Peninsula League where he had played in a premiership side in 1949. Prior to playing for Frankston he played for Crib Point. Wodonga and Towong Sentinal, January 29 1954, reported that Don Calder has been appointed coach of the Wodonga Football Club. Don played in the Lightning Premiership at the M.C.G. on Coronation Day, Tuesday June 2 1953. The same day, The Argus reported that Calder has had a run with Collingwood, but has decided to remain with the Blues. 1951 - Murie Cup (Runner-up in the Reserves Competition Best and Fairest). Contributors to this page: blueycarlton , Bombasheldon , pblue , molsey , tmd1 , WillowBlue , p(12)terg , bazzaboy , keogh , true_blue24 and admin . Page last modified on Saturday 14 of July, 2018 07:54:30 AEST by blueycarlton. 1986 Rd 7 - Tom Alvin fends of Gary Shaw. 1995 Qual. Final - Fraser Brown scoots off with the footy.